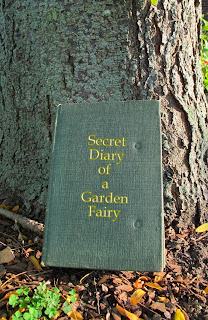 I sort of made a promise to myself that I wasn't going to read any more of the Secret Diary of a Garden Fairy. It rained and rained some more so I couldn't go out and actually work in the garden. I began to browse through some of my old gardening books instead. I pulled a few random books off the shelves and leafed through them - how else should one read a gardening book. I rearranged a couple of other books that were stacked up on a table, waiting for me to find more shelf space for them. That's when I found the Secret Diary of a Garden Fairy again. I was sure I had left that diary outside at the base of the honeylocust tree, per the instructions written in the back of the diary. How did it end up in a stack of old gardening books inside? I don't claim to know all the ways of the garden fairies. I assume someone, presumably the owner of the diary, put it in that stack of old books so I would find it, yet again. Sometimes I feel used by these garden fairies. I picked up the diary and began to leaf through it. I assumed there was some important entry they wanted me to find and post about. I looked through the diary from front to back, and from back to front, and was just about ready to put it aside when I found a most intriguing entry. "Oh, I shouldn't post that," I thought. But then again maybe I should? Yes, you should post it!